Test Day and Graduation Day! On 16 Jan 2014, we had our first batch of members to test for Student Grade (SG) Levels 1 and 2. There are 5 parts of the WTK test and each part has a set of requirements that the members need to meet in order to move forward to the next grade level. On 20 Jan 2014, we had our first batch of graduates! During Graduation Day, we presented the members that met the grade level requirements their Rank Certificates. Afterwards, we covered each part of the test and focused on some of the movements/drills that needed fine tuning. Finally, we provided them with the requirements for the next grade level and trained on the SG3 Sensitivity drill (i.e. follow-up movements to the blocking drills). We are really proud of all of our members. 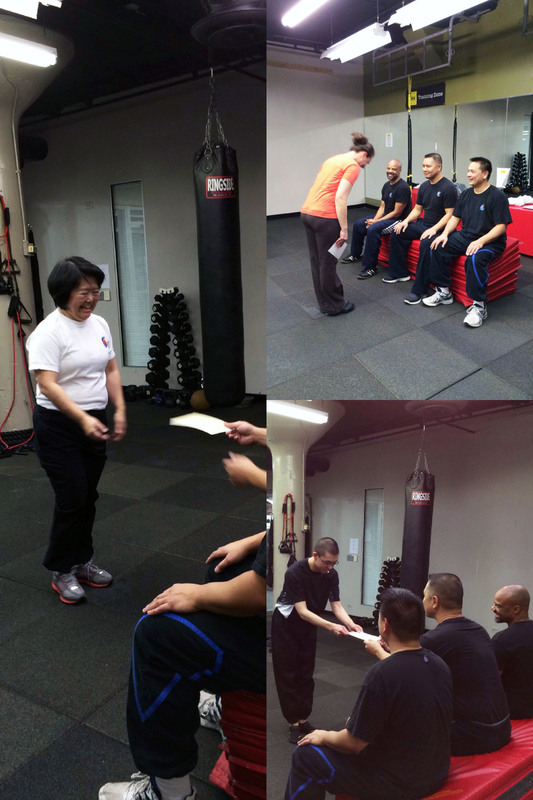 They have put a lot of time and hard work into their training and it showed during their test. Congratulations to Jennifer (SG2), Randy (SG2), Barry (SG2), Julie (SG2), and Will (SG1)!